Could laser dentistry finally get your oral health back on track? It’s amazing how far dental technology and procedures have come over the decades. Now your Houston, TX dentist makes it easier and easier for you to have the smile you want with simpler and less invasive procedures. One of the services we offer is laser dentistry, which can be used for a variety of different procedures. Laser dentistry boasts a multitude of benefits that you can enjoy when you come into our office for treatment. Years of dental research, and we’ve finally found a way to remove decay, disinfect with a root canal, and perform surgical gum or bone procedures without the need for painful drills. Waterlase is a handheld tool that uses water and air pressure to cut through both hard and soft tissues in the mouth. 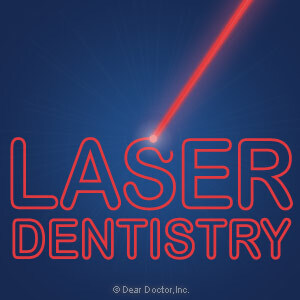 What are the benefits of laser dentistry in Houston, TX? One of the major benefits of Waterlase is that it doesn’t use heat or vibration to remove oral tissue, which is often what causes pain and discomfort during a root canal or filling a cavity. Waterlase can be performed painlessly with less anesthesia and no need for a drill. Furthermore, since laser dentistry offers better precision than a drill this reduces side effects such as bleeding, pain and swelling after treatment. This also means that there is less of a chance that you’ll need to take pain medication to manage your post-treatment symptoms. Traditional drills can cause micro fractures to the teeth, which can lead to problems in the future. However, when your Houston, TX dentist uses Waterlase you don’t have to worry that healthy enamel will be damaged as a result. No friction or pressure generated by Waterlase means that the rest of your tooth remains healthy. Dealing with a cavity or need a root canal and curious to know whether laser dentistry could help? Then schedule an appointment with your Houston, TX dentist at Today’s Dental!